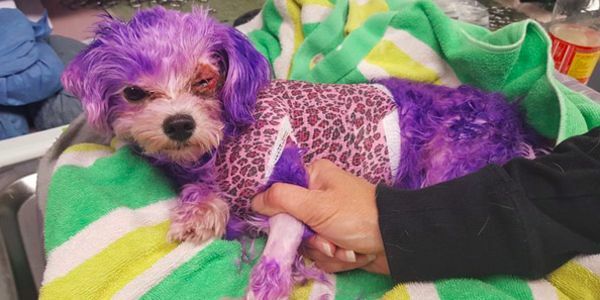 Violet is a five-lb maltese mix who almost died after her owner decided to try and dye her violet. It's a horrific case of animal cruelty. Dogs are companions, not accessories. This dog owner should be investigated, charged and prosecuted to the full extent of the law for this abuse! This tragic picture of Violet is when she arrived at the Pinellas County animal shelter. Her eyes were swollen shut and she couldn't move at all. She had burns all over her body and as the staff shaved her to assess the damage, her skin began to slough off. No one thought Violet would make it through the night. Miraculously Violet made it through the night and through months of painful treatments. She is still at risk for eye and ear infections and will never look the same again. Thanks to the staff at PCAS, Violet has a new home and should make it through alright. But that still means someone out there tried to dye her and then just left her at the shelter when they realized the damage done. We can't let that person get away with such a heinous crime. Sign on to demand Pinellas County police take this case seriously and find the offender.